Imagine waking up one morning to discover an acclaimed artist has made an artwork out of your Instagram photo. He blew the image up, added a snarky caption, and placed it alongside 37 other ‘Instas’ in one of the world’s foremost galleries. How would you feel? Flattered? Perturbed? Enraged? Now, would your response change if you learned said artist sold the blown-up Instagram photo for $90,000? What if most of the images, yours included, were sexualized shots of beautiful women? This may seem like a strange thought experiment, but it’s exactly what Richard Prince did in “New Portraits,” a 2014 show that sparked controversy for the way it repurposed social media images from celebrities and unknown teenagers alike. Some lauded the works as genius commentary on an era of digital oversharing, while others found them appalling, even accusing Prince of theft. It’s easy to come down polemically on one side of Prince’s show, but those gut reactions tend to conflate two things: legality and aesthetic merit. Art and law, after all, have become increasingly intertwined in Prince’s chosen genre of “appropriation art”: art that makes use of materials produced by others. Back when Duchamp was appropriating, his work was judged in terms of its artistic merit. Critics did not ask if repurposing a urinal was legal; they asked if it was art. These days, however, appropriation art is assessed by legal standards, as well. The Copyright Act of 1976 allows some provisions for works that “recast, transformed, or adapted” previous materials, in particular if the end goal is “criticism” or “comment.” The slippery wording bars artists from simply copying older works, but leaves wiggle room to use others’ art as the basis for new pieces. History tells us that there is good reason to allow for certain types of appropriation. Flexible copyright laws encourage artists to innovate and criticize older materials. But appropriation can also lapse into forgery and exploitation. Copyright must strike a balance between protecting pre-existing artworks and encouraging new ones. It must work on the blurry lines of what constitutes real “transformation” or “comment” — questions that often lapse from legal procedure into art criticism. To clarify those blurry lines and to contextualize “New Portraits” amidst the current debate, here are four case studies that explore and complicate what defines appropriate appropriation. Warhol often made use of work attributable to specific people or groups, while Duchamp appropriated materials that were not originally intended to be art. Warhol’s Marilyn Monroe silkscreens, for example, added psychedelic colors to a photograph originally taken by Gene Korman to promote Monroe’s film “Niagara.” Other works made use of advertisements or materials from mainstream media, creating Pop Art aimed at dissolving the barrier between low culture and high art. Visual transformation accompanied social commentary; both the colors and the significance of the original work changed at Warhol’s hands. However, at this point in Warhol’s career the Copyright Act had not yet been passed, and in 1964, Patricia Caulfield sued Warhol for reproducing without attribution images she published in Modern Photography. Warhol claimed he took an unremarkable photograph snapped by an amateur woman photographer and turned it into a remarkable piece of art worthy of high sale prices — his “Flowers” series. Except Modern Photography Executive Editor Caulfield wasn’t an amateur photographer, and her process of carefully capturing a vase of hibiscus in Barbados hardly involved mere snapping. After a litigation battle, Caulfield eventually won a cash settlement, and she set the standard that reproduction in the name of art would not always be permissible in the eyes of the court. But applications of that standard were still far from clear. Would Korman’s promotional work have been deemed fair use had he decided to sue? Appropriation art became a full-fledged movement in the 1980s, led by a group of artists interested in testing the boundaries of originality. Instead of working with advertisements or urinals, they tended to specifically appropriate other artists’ work. Sherrie Levine’s series “After Walker Evans” features images about as close to an exact copy of another photograph as you can get — so what exactly was she transforming? This is a sticky and controversial point: two identical images will be perceived differently depending on the cultural context in which they exist. We know that Levine’s photography is reproducing something, so we think about the process of reproduction — whereas Walker Evans’ original photo would have prompted very different ruminations. It’s notable, too, that Levine had an explicitly political bent in mind: criticizing a patriarchal art world that historically disadvantaged female artists. Though that critique would not necessarily have changed the legality of her photograph, it may be why her work is looked on more favorably. Though she remains privy to debates of artistic intent, Levine was never taken to court, for Evans’ photos had been taken for the Farm Security Administration and were thus in the public domain. Appropriation, then, does not require the skirting copyright laws. Many works, like those of Evans’, can be repurposed without fear. Remember those street-art posters from the 2008 Obama campaign? You might not have thought of them as appropriation art, but Shepard Fairey based his image on a photo taken by Associated Press photographer Mannie Garcia. Fairey changed the color scheme of the photo and added lettering — but that wasn’t enough “transformation” to prevent the AP from successfully suing him for copyright violation. (The two parties settled out of court in 2011, and Fairey was sentenced to probation and fines for criminal contempt related to the case in 2012.) So what distinguished his work from Warhol’s and Levine’s? As for the difference between the poster and Warhol’s Monroe prints? If Warhol had taken an AP photo, he would likely have faced a legal battle — though the fact that his work commented on the act of reproduction might have proved a better case than Fairey’s. Warhol, by one account, was making a conscious choice to appropriate, whereas Fairey, it could be argued, did so because it was easier to use someone else’s image. Perhaps the most important precedent for Prince’s current show is his own work. 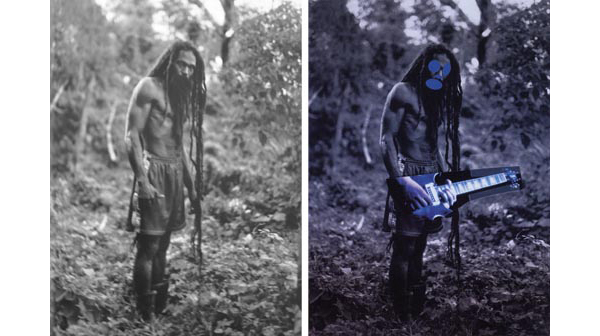 In particular, a 2008 series “Canal Zone,” which appropriated photographs of a Rastafarian community from Patrick Cariou’s book Yes, Rasta. Unlike Fairey, this was intentional appropriation, but unlike Levine, the intent was not exactly clear. When Cariou sued Prince for copyright infringement, he first won the case on that account: the judge claimed that Prince’s appropriation art had to “comment on Cariou, Cariou’s photos, or on aspects of popular culture closely associated with Cariou or the photos.” It had to do more than casually alter the piece, and there had to be a reason to use this specific piece of art. Though this was a reasonable position, it risked turning the courtroom into a site of art criticism, where lawyers would have to parse out a work’s ironic or critical stance. When Prince appealed in 2013, the Second Circuit judge reversed the earlier decision, claiming that appropriated art need only be aesthetically transformed to be legal under copyright law. This ruling suddenly gave artists far more leeway to appropriate. If Fairey had made his poster after this decision and been honest about his use of the AP photo, he might well have won the case. By this account, Prince’s Instagram show would likely have little problem being cleared in court. But is legality the only way we should be examining appropriation art? Money and power, after all, affect our emotional responses — and perhaps those are valid sentiments. Prince’s “Untitled (Cowboy),” which took an image from a cigarette advertisement, was the first piece of appropriation art to sell for over $1 million. It’s safe to say the public felt more pity for street artist Fairey than established gallery darling Prince. And we’re more protective of our Instagrams if someone is profiting from them. But in the eyes of the law, appropriation is equally legal if a piece is worth one dollar or a billion. It does not matter whether the artwork is affirming patriarchal structures — like Prince’s — or undermining them — like Levine’s. Earlier this month, artists Arabelle Sicardi and Tayler Smith spotted their photo of trans model Hari Nef in The New Yorker, except that their original work had been altered and attributed to another artist, Zak Arctander. A passionate response to the use of their photo featured lines like “Art law is misogyny” that stressed how legal standards defend those, like Arctander or Prince, who have been historically empowered. That’s because neither economic history nor sexism, as copyright law is currently written, affect the definition of substantial or meaningful transformation. A careful examination of four case studies, then, can provide legal clarity and dispel the emotional haze that distorts our responses to “New Portraits.” But these examples also underscore the law’s flimsiness: its tendency to morph with each case, its inability to confront how power imbalances affect appropriation. A new way to discuss appropriation may be needed: one that recognizes how art criticism has entered the courtroom and how the courtroom does not explain away the criticism of art.